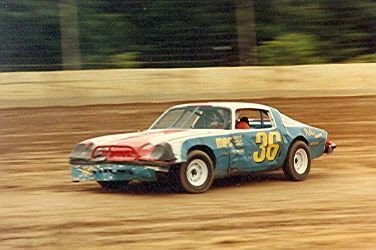 In 1980 I was again driving a "Strock Car", this time owned by Craig Strock (Keith's son). 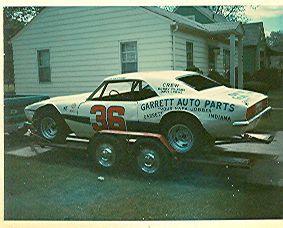 I drove this '68 Camaro for Craig at Avilla Speedway, Angola (IN) Motor Speedway, and Baer Field (Fort Wayne, IN) Speedway. We took wins at all 3 tracks. From 1980 to 1982 I ran this '71 Nova, mostly on dirt but some asphalt races thrown in. 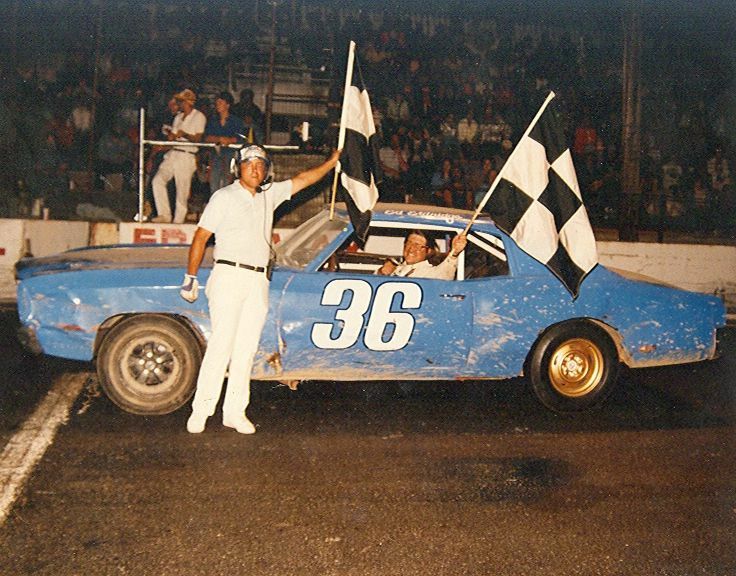 This car took checkered flags at Avilla Speedway, Angola Motor Speedway, New Paris (IN) Speedway, Bryan Speedway, and Oakshade Raceway. This was a feature win at Bryan Speedway This was one of my "winningest" (is that a word??!!) cars! 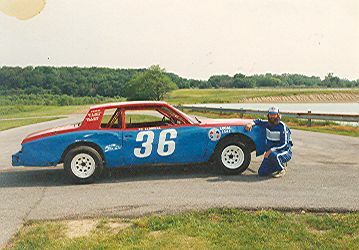 In 1983 I ran this '74 Camaro, mostly at Avilla Speedway, with a few races at Angola Motor Speedway and a season opening race at New Paris (IN) Speedway. This is another of my favorite action shots, taken on the way to fast qualifying time at Avilla Speedway. I took 2nd in the Avilla Speedway Street Stock track championship. This was one of my feature wins at Avilla Speedway, getting congratulated by the owner of a grocery store that was sponsoring the races that night. NO, I'm NOT sticking a knife into his belly, I'm holding the checkered flag!! Can you believe that Swede insisted that he didn't hit me? 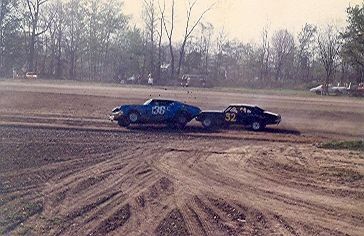 This shot was taken at Montpelier (IN) Speedway in '86. 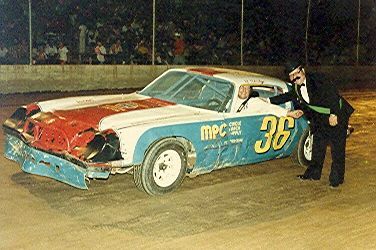 I ran this 70 Chevelle from '84 to '86 at Angola Motor Speedway, Avilla Speedway, New Paris Speedway, and Montpelier Speedway. 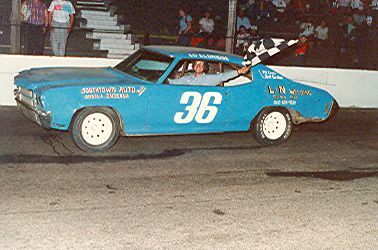 This was my other "winningest" car, taking me on an 8-race winning streak in '86 at Avilla and Montpelier, including "clean sweeps" 2 times in a row at Monpelier Speedway!! I had a clean sweep this day, and the next time I raced at Montpelier too! This is another of my favorite pics, from 1987. Tom Beezley (#69 modified), Todd Sherman (#65 semi-late model), and I (#36 street stock). Tom and Todd are 2 racers whom I admire and respect, and are friends of mine. 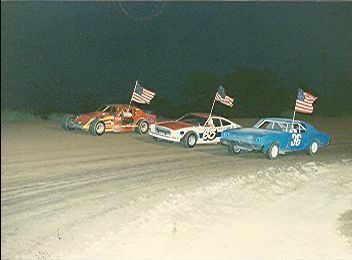 This night, we were the 3 fast qualifiers at Avilla Motor Speedway. All 3 of us carrying Old Glory for the National Anthem!! Thanks to Todd Sherman for letting me use this picture. This is another of my all-time favorite pics!! My 100th checkered flag, taken at Angola Motor Speedway on July 7, 1987. I had to get a haircut after this win, as I had sworn the year before that I wasn't gettin' it cut til #100. Then the Chevelle got totalled out (I was at #97), and I stuck to my word! In 1990 I had a couple new things. 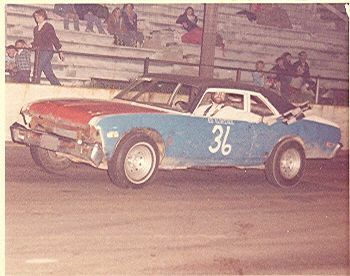 A new wife, Kathy, and this '72 Monte Carlo, assembled late in the season, so we only ran a few times that year at Avilla Motor Speedway, and a couple season ending races at Angola Motor Speedway. Our first time at Angola Motor Speedway was Season Championship night, and we came home with another feature win. 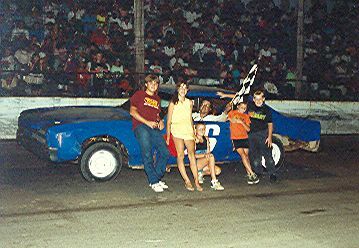 Here I am in victory lane with my older stepson, Jason (on the right), and children of Butch & Deb Kester (Butch was crewman on this car. In '93 we built this '78 Monte Carlo, but didn't get it onto the track til August. 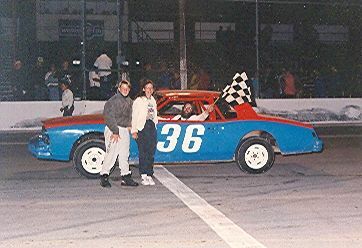 Here I'm joined in victory lane at Avilla Speedway by my wife, Kathy, and my stepson, Jason after winning the B feature first night out with a brand new car. Not a bad start! This was a publicity photo taken at Avilla Motor Speedway in '95, the last year that the track was in operation. I achieved one of my long-time goals that year, being inducted into the Avilla Speedway Hall of Fame!! Election is by vote of the members, so you are voted into the Hall Of Fame by your peers, a real honor (my opinion, of course)! My family was all there for my induction. Dad was fighting bone cancer, and we lost him in April '96. I lost my daughter, Angie, unexpectedly in July '96, but they were both still with me to see me get inducted. We also ran this car again in the '96 season, taking 9th in points at Angola Motor Speedway. My last races were at Gas City (IN) I-69 Speedway on the dirt. By the time the '97 season began, I was off work waiting to have my spinal fusion. After the operation I retired from active competition.